Last Saturday, we threw a party in Boston. Since the American Library Association midwinter meeting was already drawing many librarians and publishers to the city, we jumped on the chance to bring together bookish sorts for an evening of talking books, eating cheese and tipping a pint. 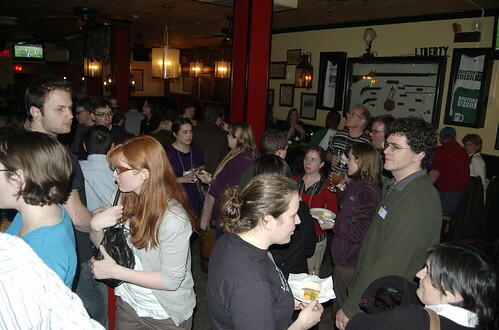 If I had to guess, I’d say there were around 75 people over the 2.5 hours we were holding court at the Green Dragon. The LibraryThing for Libraries crew announced two new features at the conference, so the booth was busy. Abby’s recap is forthcoming on Thingology. See all the pictures of the party and the LTFL booth here. Didn't get a chance to make to the 'after party,' but it was really nice meeting you guys at the conference. I hope you enjoyed Boston!